The problem with a lot of automation is that it just isn’t done to the best of it’s capability. This document is an excerpts of a research that was created for one of our clients when they needed to choose a tool for automating their tests, so some specific requirements and considerations will not be disclosed. Please consider this as a sample; not as a comprehensive reference of modern autotests frameworks. Note: if you need something like that or you have any questions please feel free to ask us. The main purpose of this document is to present the results of the research established by HiTech Service to compare several Automated Testing tools and find out the most appropriate solution, which is eminently suitable to business and technical requirements of the company project. HP Mercury testing tools (namely ‑ HP’s Quick Test Professional (QTP)) was excluded from consideration by the customer due to its not acceptable licensing policy. Solutions were evaluated basing on the list of requirement and criteria specified by the company and listed in the “Customer Needs” section. The real use and purpose of automated test tools is to automate regression testing. To perform it there should be a database of detailed test cases that are repeatable, and this suite of tests has to be run every time there is a change to the application/component to ensure that the change does not produce unintended consequences. An automated test script is a program. Automated script development, to be effective, must be subject to the same rules and standards that are applied to software development. Capacity – particularly on load testing, how many users at once, virtual clients, multiple physical client spanning, support of synchronized tests running simultaneously on several computers etc. Additional tools may be considered in the future in case of changes to the role and scope of automated testing within the project. SmartBear’s TestComplete delivers automated functional, unit, regression, manual, data-driven, object-driven, distributed and manual testing in one easy-to-use and totally integrated package at an affordable price. TestComplete shows the result in the following view. The reflection of results can be developed or customized. TestComplete is a full-featured environment for automated testing of native Windows, .NET, Java, Flash/Flex, Silverlight, WPF (XAML) applications, web pages and web services in the Windows OS environment. It has been designed to free developers and QA departments from the massive drain of time and energy required by manual testing. TestComplete is systematic, automated, and structured testing tool, with superior support for .NET, Java, Flash/Flex, Silverlight, Visual C++, Visual Basic, WPF (XAML), Delphi, C++Builder and web applications and services. It is equally oriented for testing 32-bit and 64-bit applications under all modern versions of Windows OS. With TestComplete it is also possible to test PowerBuilder, FoxPro, Access and other applications that utilize Microsoft Active Accessibility (MSAA) technology. TestComplete is the ultimate solution to perform nightly tests and to help to get reliable daily builds of the developed software. TestComplete tools and features let every member of the team, developers and non-developers, no matter how technically savvy they are, to contribute to the testing projects. Manual Testing with possibility to mix manual and automated steps within one test. Ranorex allows quick and easy implementation of GUI (Graphical User Interface) automation scripts based on the common programming languages C# and VB.NET. The Ranorex Premium Edition provides all necessary features and tools to automate applications with the most common programming languages. Use the power of object-oriented programming techniques to develop professional test and automation systems. Create, manage and debug automation projects with existing development infrastructure like Visual Studio. Tested applications require additional instrumentation before they can be operated by Ranorex. Selenium is a Web browser automation tool written in Java with the very limited support of testing other application types and/or communication with them. Tests can be created using Java, Ruby or Python languages. Selenium tool is provided in a form of a runtime engine without any environment to develop, debug and manage tests. 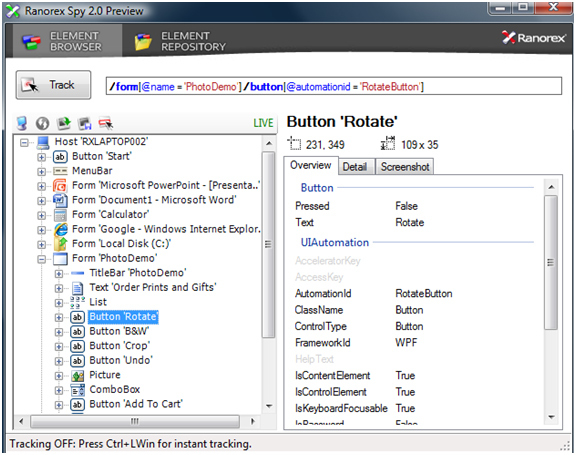 All this functionality is provided by the separate stand–alone tools like Eclipse, etc. All licenses are perpetual and include one year of free upgrades/maintenance. Evaluation of the tools revealed that neither of them can recognize and process items added to the image in the SRS editor (notes, labels, etc.) as separate entities. More investigation in this area is required, but there is a grounded expectation that the problem will be solved. Also, neither of the tools support functionality like Load/Stress testing and code performance. This functionality is usually delivered by the separate tools like load testing software (the former) and code profilers (the latter). SmartBear provides such tools (at the cost of separate licenses) while neither Ranorex nor Selenium have similar suggestions. 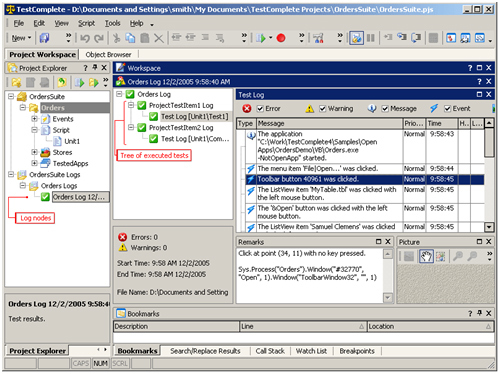 Great integrated development environment for tests creation and management. The features mentioned above distinguish Test Complete from the competitors and allow its easy integration into development environment and testing process of different companies. Another benefit is easy learning and test development process. The tool has intuitive interface which will significantly reduce learning curve for existing and new team members. Test development and support time is also minimal due to wide support of scripting languages, integration with other tools and combination of all testing in one package. Ranorex tool seem to have practically the same functionality as TestComplete (except distributed and web services testing) but slightly higher price for the required licenses. Selenium tool is good for automation of web browsers but provides no support for testing other application types. Because of the limited technical support and test development environment (which, in many cases, requires usage of separate extensions), the learning curve and the cost of tests development, support and execution is expected to be on the same level as for TestComplete and Ranorex, even despite the fact that Selenium itself is free.